As a simple translation, trompe l’oeil is French for “deceive the eye.” When it comes to decorative painting, many surface treatments can be described as trompe l’oeil, but in all cases, the artist is trying to fool the viewer, either in terms of materials or dimensions, or sometimes both. The most common type of trompe l’oeil is architectural or surface ornamentation, usually molding, that is painted on to create an optical illusion of three dimensionality. In fact, painted moldings often look so real that your eye will skip right over them, not picking up any visual cues that tell your brain something is amiss. 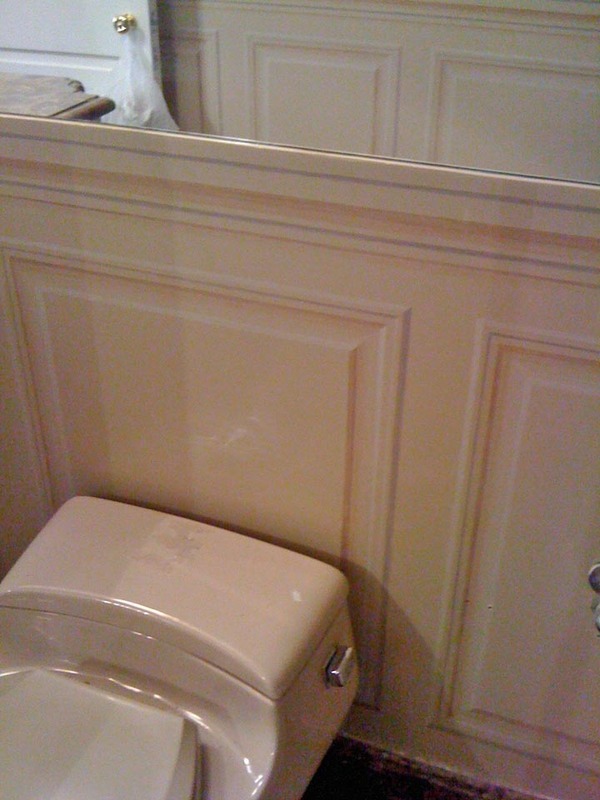 In the bathroom below, I painted moldings onto the walls below the mirrors. The walls are flat. Here’s the opposite wall. Although this room consisted of just two short walls with a total of five painted panels plus a chair rail, it took three days. Everything has to be sketched out before any painting begins. I like this photo because you can see the reflection of the other wall in the mirror. 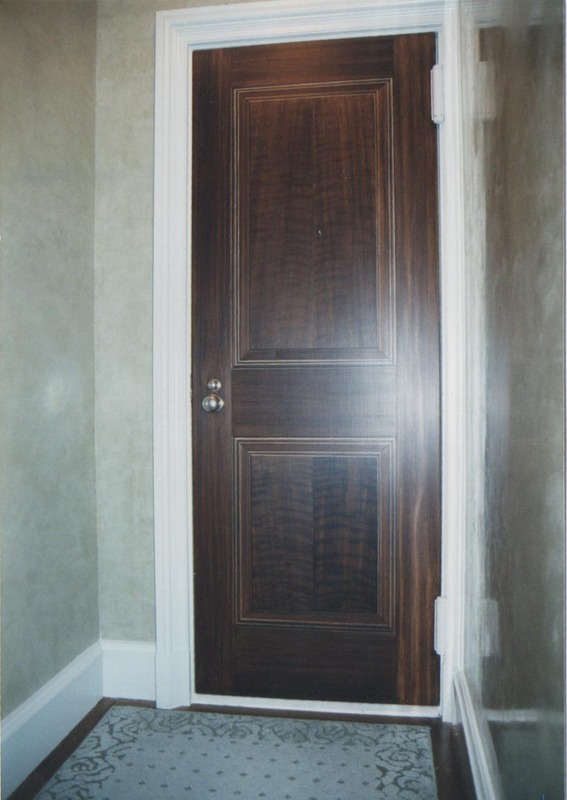 In the photo below, the door has been painted in a faux mahogany finish, and the moldings are painted on top to create an illusion of applied moldings. The surface of the door is flat. This was the first trompe molding job I ever did and I was sweating bullets the whole time. Actually, it was one of the first faux mahogany doors I painted as well, so it was an anxious few days! This door was painted to match existing mahogany doors in the next room. When I began painting trompe l’oeil, other than learning the technique, i wanted to understand why it was possible to fool the eye. After all, once I realized that a molding was painted on, I saw it that way whenever I looked again. Why did I miss it the first time? I found out it’s because our brains are lazy. They want to recognize and categorize visual information as quickly as possible. In its rush to do this, the brain will “see” something that doesn’t exist, settling for what it expects to see instead of taking in what’s actually there. This is handy information. As long as I understand what particular elements create the illusion, and I don’t paint something that will contradict this, the illusion will be successful. 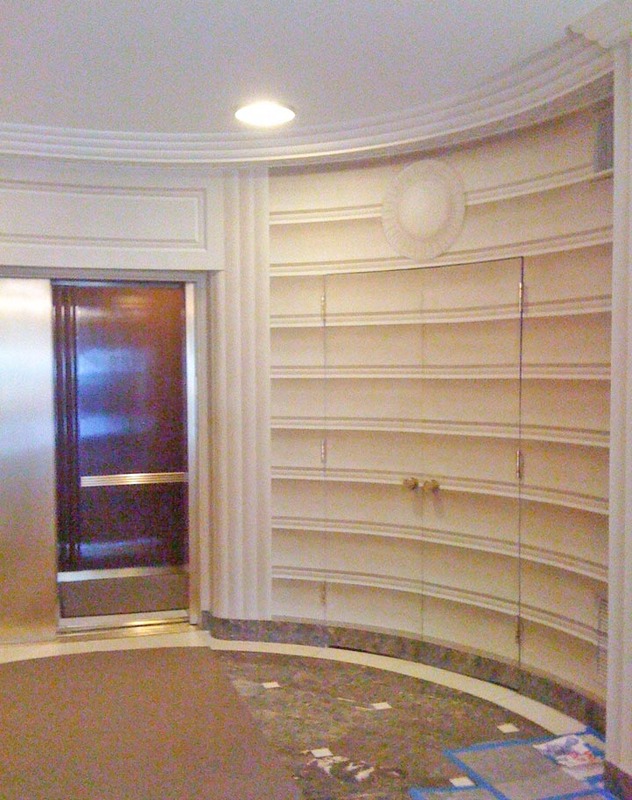 This next example of trompe l’oeil is a lobby in a private apartment building on Fifth Avenue completed a couple of years ago. The lobby is composed of two curving walls with an elevator in the center. Again, the walls are flat and the 3-D effect is entirely painted. Here’s the left-hand wall. 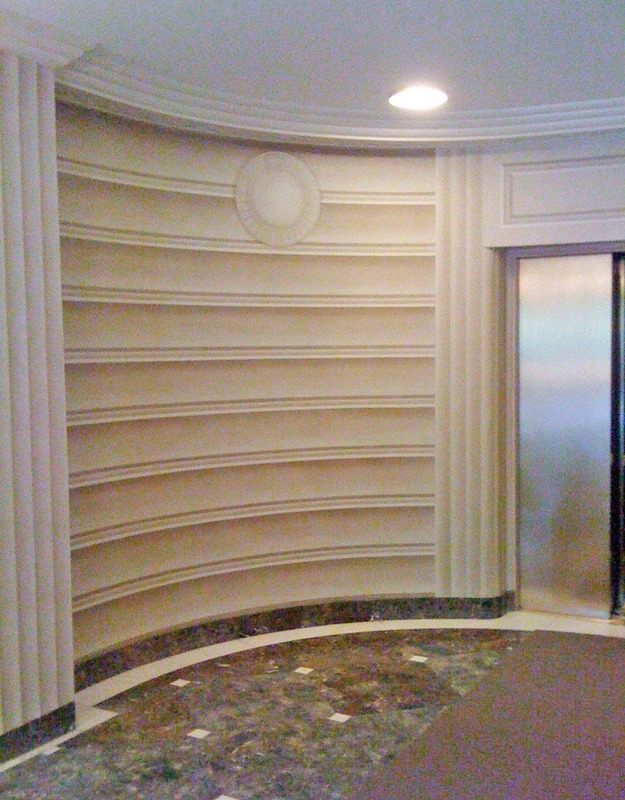 While the column on the far left is actually fluted, the column next to the elevator is part of the wall, painted to appear dimensional. This is the right-hand wall. There’s a service door to the back hallway cut into the wall. Here’s a close up of the left-hand wall. Everything you see here is painted on a flat surface, except for the crown molding at the top. Usually I paint trompe l’oeil in water-based paint, but in order to make the gradations of tone as seamless as possible, these walls were glazed in oils. This presented a whole other set of challenges regarding drying times and the ability to tape off adjacent surfaces, requiring us to jigsaw-puzzle the design together. It took two of us seven days to complete these walls. We went through what felt like about a mile of tape! 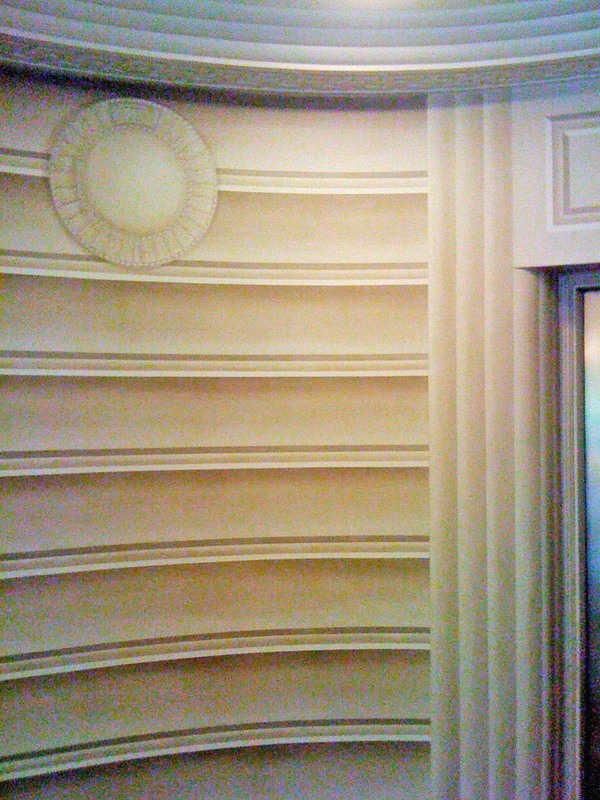 Architectural detail is just one type of trompe l’oeil; I’ll explore other types in future posts. Painting trompe l’oeil is gratifying because of the thrill of achieving the visual deception; at the same time, it’s so difficult that I usually accept projects like this with a mixture of fascination and apprehension. But so far they’ve all worked out in the end. My decorative painting clients are obsessed with details. They examine every square inch of a room to make sure it’s exactly how they’d like it to be. 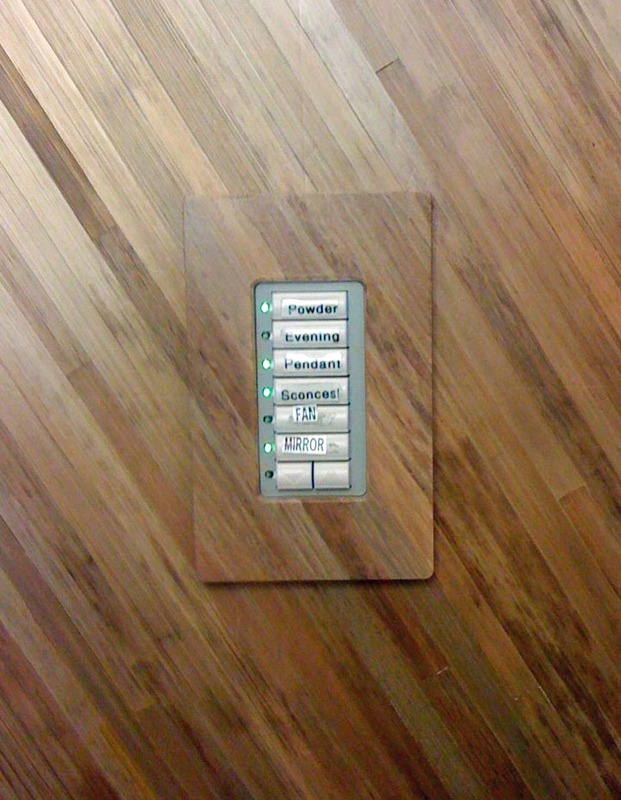 Switch plates are usually ugly, a piece of plastic or metal marring a beautifully finished wall. 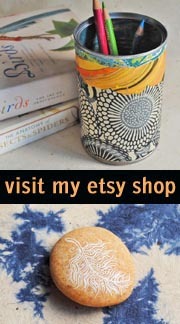 I paint them to match the background, whether it’s a painted finish, plaster, wallpaper, fabric, wood, stone, leather or tile. 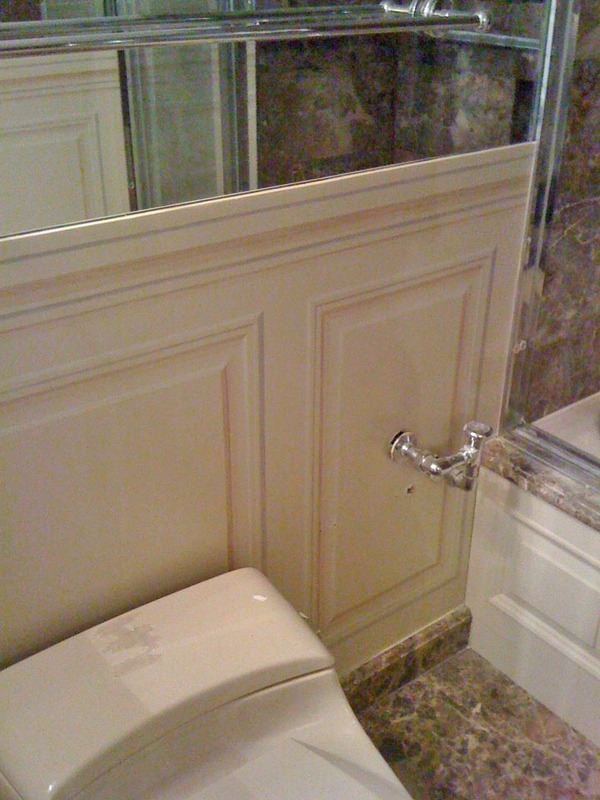 In this case, the Powder Room walls are straw marquetry and the switch plate must follow the pattern. I forgot to take a photo before I started, so here’s the plate already in progress. First, I used a flexible steel ruler to draw the lines of the marquetry across the plate, then painted the pattern with acrylics, followed by a coat of matte varnish. Voila! 90 minutes in all. Sometimes I think about what the most important skills are for a decorative painter, and after “100% dependable” and “meticulously tidy” comes color matching. It doesn’t matter how well I can mimic a texture; if I can’t match the color, the work will be considered unacceptable. 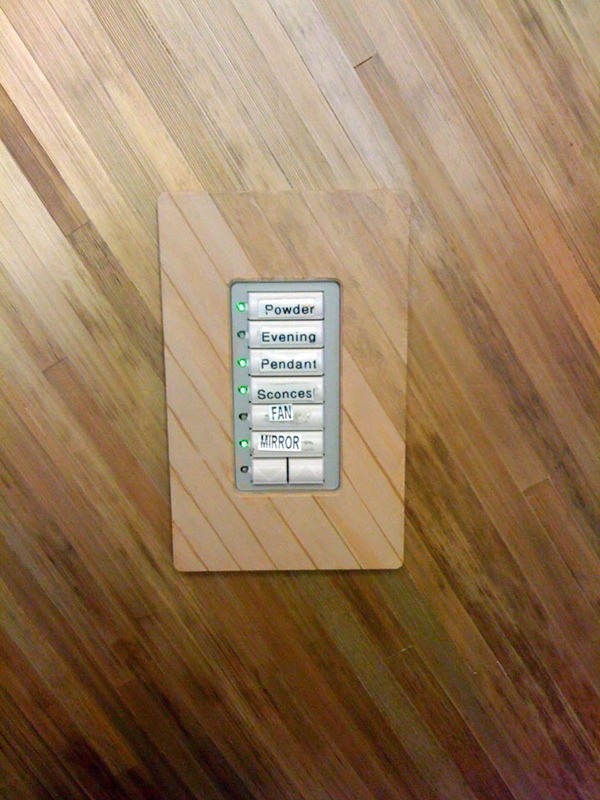 I’m not sure how a switch plate for a tiny Powder Room has eight control buttons; did I mention detail-oriented clients? These rough labels are replaced with properly printed ones when the lighting controls are resolved. 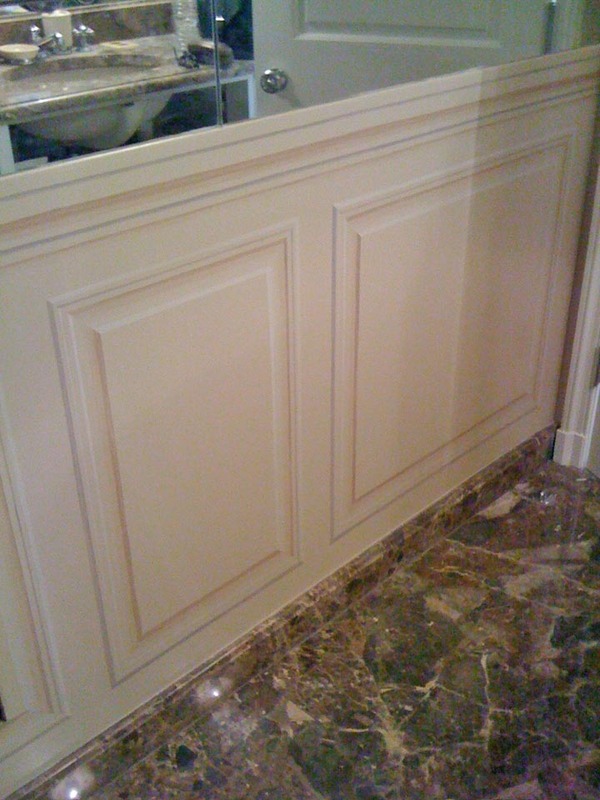 Here’s a portion of the Powder Room walls between the marble wainscoting and the ceiling. 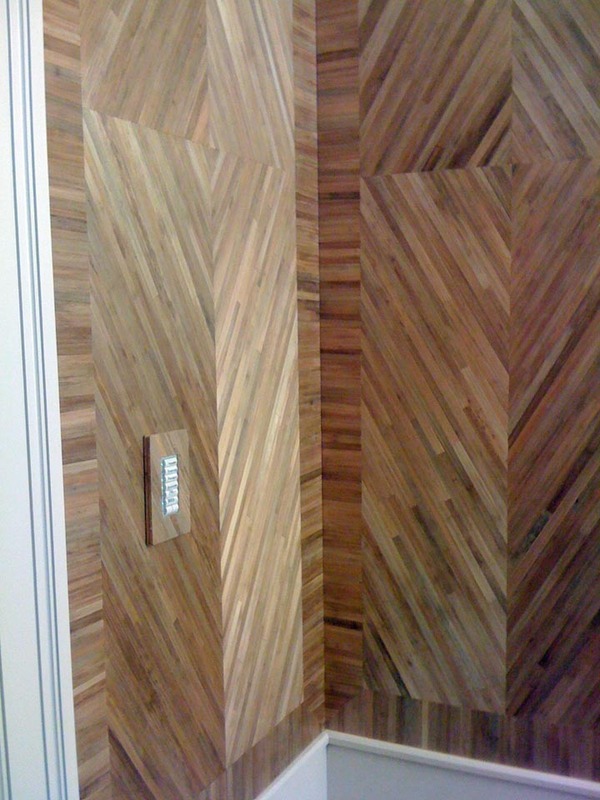 I had never seen straw marquetry before I worked in this room. It’s similar to wood marquetry, except instead of using wood, the craftsperson is using wheat, rye or oat straw which is split, soaked in water, dyed, ironed and then glued to the wall. It took two weeks for the artist to to painstakingly glue down the straws one at a time to create these beautiful patterns. 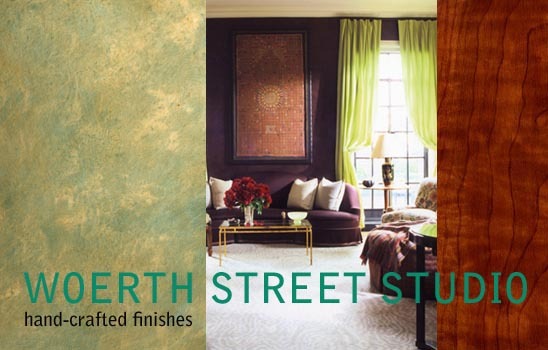 Here’s a site highlighting straw marquetry artists, who work with a variety of straws to embellish walls, furniture and objects. I thought painting required patience… it’s nothing compared to this crowd!